The original canal, built to transport anthracite coal from northeastern PennsylvaniaÃ s great Lackawanna coal fields to New York City, used a slack-water crossing of the Delaware River between Lackawaxen, Pennsylvania and Minisink Ford, New York. A still pool had been formed by damming the Delaware, into which the boats were brought down through locks built on both banks. They then crossed the river either by momentum or hand haulage along a ferry rope strung between the banks, while the mules were carried over separately on a small rope ferry. Even under ideal conditions the crossing was slow and a serious operational snag. At worst, during high water in spring and fall, the passage was impossible and canal operation had to be suspended days at a time. A further hazard was conflict with considerable traffic of timber rafts on the river. The rafts men, forced to traverse the low canal dam either by shooting it on the water flowing over the crest or passing through a sluiceway, were generally hostile and constantly engaged the canal company in physical and legal harassment. An aqueduct had been projected from the canal’ s beginning. It was included among the scheduled improvements as money from canal profits became available. In February 1846 the canal directors authorized the aqueduct, and by late December two proposals had been received. One was for a conventional, trussed timber six-span structure on masonry piers. 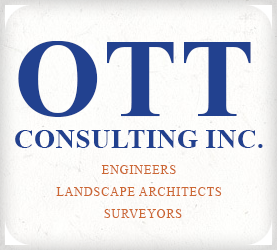 The other, submitted by John A. Roebling, a civil engineer of Saxonburg, Pennsylvania, was for a four-span wire cable suspension aqueduct. Following an inspection trip to the Allegheny Aqueduct, a similar structure built by Roebling in Pittsburgh, the contract was awarded for the four span scheme, which was not only cheaper but also reduced impeding flood waters and ice because of fewer river piers. Another major advantage was that the suspension spans could be erected without false work in the river. The superstructure of the aqueduct is supported on parallel wire cables, one on each side of the bridge, seated on cast iron saddles mounted on squat stone towers that stand about four feet above the top of the trunk described below. Each of the 8 1/2in-diameter cables is composed of 2,150 wrought iron wires spun in place and anchored to eye bar anchor chains. The chains are encased in cement grout to exclude air and moisture and thus prevent rusting, and embedded in stone masonry anchor blocks. The cables are wrapped continuously with a tight fitted wire. The flume was of heavy wood construction holding about 6 feet of water. It was 17 feet wide at the bottom, 19 feet at the water line and 20 feet at the top. Its sides were built up of two thicknesses of 2 1/2 inch untreated white pine plank, laid tight on opposite diagonals and caulked up to the waterline, in effect forming rigid, solid lattice-trussed webs. The floor was of double plank placed on transverse double floor beams which hung from I 1/4 inch-diameter wrought iron rods. These suspender rods doubled over the cables in stirrup form, and their bottom ends were threaded for the floor beam nuts. They were supported on the cables by means of small cast iron saddles clamped to the cables and prevented from sliding by spacer bars where needed. An 8-foot towpath was cantilevered out from each side of the flume, level with its top. The stiffness of the woodwork, including the flume and the two towpaths, was such that it was capable of sustaining its own weight, leaving the cables to carry their own weight and the water load. The aqueduct superstructure was 535 ft long, with three spans of about 131 ft and one of about 141 ft. Its flume was wide enough to accommodate boats of 130-ton capacity. Placed in service after the last deepening and widening of the canal was completed in 1852, these large boats had the advantage of being river worthy, thus eliminating the need for transshipment on reaching the Hudson. The last boat moved over the waterway in 1898. 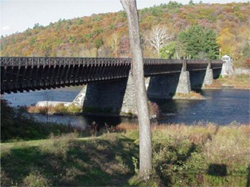 The Delaware River aqueduct was then purchased privately and converted into a highway bridge. A fire in 1932 destroyed the woodwork on a portion of the structure. A simple floor system was substituted and the toll bridge reopened to the public, giving over four decades of further service. Faced with mounting maintenance costs, the last private owner closed the bridge and in 1979 sold it to the National Park Service. After temporary repairs, the bridge was reopened to pedestrians in 1980. Studies of the soundness of the structure preceded a more permanent rehabilitation which also restored the basic historic aspects of the bridge. The permanent rehabilitation was completed in 1995 and the bridge was reopened to vehicles. Part of one of the earliest major railroad links between the Eastern seaboard and the Midwest. It spans Starrucca Creek at Lanesboro in northeastern Pennsylvania. It is 1,040 feet long from abutment to abutment, about 90 feet above the ground and about 25 feet wide at the top. The bridge has 17 semi-circular arches of 50-foot diameter supported on slender piers. Downward from the smallest cross section at the root of the arches, the piers increase in width both parallel and transverse to the direction of traffic. The thirteen full-height piers are supported on concrete spread footings three feet thick. The footings bear on hardpan at a depth of no more than 9 feet below the ground surface. For the three shorter piers at the ends of the bridge, the stone masonry was laid directly atop the surface of the hardpan. The piers and the arches are built of stone. The arches support outside parapet stone walls and three inside parallel longitudinal brick walls. In turn, the five walls carry the bridge floor including a flagstone base and ballast. The viaduct was designed by Julius W. Adams and built by his brother-in-law, James P. Kirkwood. First class railroad builders, they came from different backgrounds. Kirkwood, born in Edinburgh (Scotland) in 1807, completed his formal education by the age of 12 and two years later was apprenticed to a surveyor who founded a firm with a large practice serving railroads and canal interests. At 25, Kirkwood moved to the United States where he soon became a resident engineer on railroad construction in western Massachusetts. Adams was born in Boston in 1812 into the family of presidential fame. He won an appointment to West Point but resigned after two years to work on the construction of the Paterson & Hudson River Rail Road in New Jersey. In the ensuing years both Kirkwood and Adams participated in the building of several rail lines. In later years both settled in Brooklyn and developed consulting practices in new branches of civil engineering: water supply for Kirkwood and sewage systems for Adams. Both were founders of ASCE and served later as ASCE presidents, Kirkwood as the second and Adams as the sixth. The viaduct was located on the New York & Erie Railroad, a project that promised to open up a broad, virtually untapped corridor between the existing railroads and canals of Pennsylvania and New York. After ground was broken in 1835, repeated delays caused the real work on the 445-mile line from Hudson to Lake Erie to get underway only in 1846. The construction of the viaduct was started in the spring of 1847 and a contract with Messrs. Beard & Collins to build the viaduct was dated August 7, 1847. The job was to be completed by the end of 1848. The contractors Ã¬showed so little energy or appreciation of the magnitude of the task to finish within one yearÃ® that the job was taken from them in the spring of 1948 and turned over to Kirkwood who was hired by the Erie as superintendent of the construction. Kirkwood took the job with the understanding that time was of essence and cost was no object. To cross the Starrucca Valley, a massive fill was considered at first with a stone arch over the creek, but good borrow pits were unavailable because much of the area was underlain by hardpan. A stone viaduct was decided upon, made of rubble laid in beds of cement mortar since the countryside abounded in flat stone about 3 inches thick. When a quarry a few miles up the Susquehanna Valley was opened Adams learned that blocks of stone 9 to 18 inches thick could be had in quantity, and adjusted his plans accordingly. A track ran 4 miles up the Starrucca Creek from the viaduct site to the quarry from which came most of the stone used in 1848. The remainder was hauled from other quarries by wagon. The material was fine-textured gray sandstone, locally called bluestone. It was laid in mortar made of Rosendale cement mixed with sand and lime. This natural cement came from a works opened in 1828 at Rosendale, New York. The labor force in May 1848 is said to have numbered about 800. To finish the viaduct in a single season, the false work was largely built ahead of time, a full set of wooden centering was made for every arch, manpower and equipment were provided in excess, and the entire plant was kept in first-class working order to the placing of the final stone. In time the false work for the viaduct Ã±a combination of trestle, scaffolding and arch centering Ã±stood 90 to 100 feet above the valley. A large quantity of the lumber was provided by a local businessman and a large number of small operators were engaged by Kirkwood to cut stone and lay masonry. The first locomotive crossed the viaduct on December 9, 1848 and the official inauguration took place after Christmas. Nearly two and a half years later the railroad was finished to Lake Erie. The inaugural excursion left New York on May 14, 1851, with President Millard Fillmore, Senator Daniel Webster and other dignitaries among the participants. At Susquehanna Depot, sixteen locomotives saluted the party with their whistles. Ã¬Today,Ã® said Webster when the excursionists stopped at Elmira for the night, Ã¬the locomotive has overcome mountain steeps and walked over the tops of forest trees. Tomorrow it will climb other hills, cross other valleys, and, at last, rest by the waters of Lake Erie”. Originally, the viaduct carried one track of broad 6-foot gage placed on 3 feet of stone ballast over the flagstone. As the time went on, the gage was changed 10 the standard 4 feet 8 1/2 inches, the surfacing above the flagstone waterproofed and increased in overall thickness, and a second track added. The size of the locomotives crossing the structure increased from 15 1/2 tons to the maximum of 422 1/2 tons. Major maintenance items required pointing of joints and, in 1961, sandblasting of the entire structure. After a century and a half of service, the viaduct continues to serve its original function and is expected to do so into the foreseeable future. Also known as the Nicholson viaduct, is the largest structure of its kind. It was built in 1912-15 of reinforced concrete to carry the Lackawanna Railroad over the Tunkhannock Creek near Nicholson, Pennsylvania. It is 2,375 feet long and 34 feet wide, and carries double-track railway traffic at a height of 240 feet above the creek. The viaduct consists of ten visible 180-foot and two buried 110-foot full-centered arches. Each arch is made of two halves, one on each face of the bridge, with a six-foot opening between them. The piers supporting the arches are carried to bedrock. The depth of excavations was 60 to 138 feet. The roadway is supported by small spandrel arches connected to the 180-foot arches by vertical transverse walls. The first section of the original main line of the Lackawanna Railroad was constructed in 1851 to move coal from the Lackawanna Valley to markets to the north. It ran from Scranton to connect with the Erie Railroad at Great Bend. 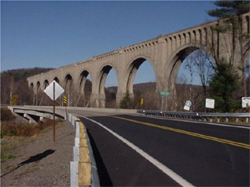 The Tunkhannock Viaduct is an integral part of the Clark Summit New Milford cutoff whose section from Scranton to New Milford was essentially the same as that built in 1851 and was in much need of modernization. George J. Ray, chief engineer of the Lackawanna Railroad, and his fellow planners approached the problem with daring and imagination. They proposed to cut across the natural drainage of the country at right angles instead of following rivers, to lop off the tops of the mountains and use the earth and rocks to fill the valleys, and to layout a line, if possible, without grades and curves. The railroad climbed from Scranton to Clarks Summit but then it was to stay at the same level until it reached New Milford and finally to dip slightly down into the valley of the Susquehanna River. The New Milford cutoff saved only 3 miles but the reduction of grades and the elimination of curves cut running time between Buffalo and Hoboken by hours and eliminated the need of helper engines along these sections. The savings in extra engines and crews more than compensated the railroad for the expenditures made. The contract for the construction of the viaduct was awarded in the spring of 1912 to Flickwir and Bush Incorporated, Flickwir being a veteran contractor experienced in building railroads and Bush an ex-chief engineer of the Lackawanna Railroad. Giant wooden towers were built at each end of the crossing and another one near the center to support an aerial tramway for moving materials to position on the project. The towers at the ends were 169 feet high while that at the center soared 300 feet into the air. Under the tramway there was a beehive of activity, with 4000 feet of narrow gage track over which a rolling stock of 14 flat cars and 4 engines hauled the reinforcing steel rods and buckets of concrete from the mixer to the foot of the central tower, where it was hoisted to the tramway and moved laterally into the desired position. As the piers reached the first level, giant steel arches were placed to support wooden forms for the main arches and remained in place until the concrete was properly cured. The steel was then moved to another opening where the process was repeated. Construction was completed in 1915 and the viaduct has been in continuous service since that time without any major modifications or extensive repairs. The largest and best equipped university structural laboratory in the United States upon its completion in 1910. 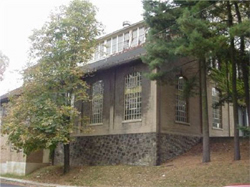 The laboratory was donated to Lehigh University by John Fritz, Honorary Member of ASCE known as the Ã¬father of the steel industry in the United States.Ã® The tests conducted at the laboratory over the years led to new, superior approaches to the design of a wide variety of civil engineering structures. For example, the gates for the locks of the Panama Canal, design procedures for reinforced concrete columns, plastic analysis and design procedures, and the fatigue strength of steel structures were among the many investigations conducted over the years at Fritz Lab. John Fritz came to Bethlehem in 1860, hired by Robert Sayre, general manager of the new Bethlehem Iron Company, to design and build rolling mills and blast furnaces. Fritz and Sayre built the company into the largest manufacturer of steel armor plate and gun forgings in the world. The two also worked together on the Lehigh Board of Trustees from the universityÃ­s founding in 1865 until Fritz resigned in 1897. In 1907 Fritz joined the Board of Trustees to begin the development of what would prove to be his greatest gift to Lehigh. Each day in 1909, as the original section of Fritz Lab was under construction, Fritz was there to supervise the work on the testing facility he had designed, equipped and donated to Lehigh. Fritz Engineering Laboratory was patterned after the shop buildings that Fritz had erected at the Bethlehem Iron Company. This type of building would provide for proper space, good lighting, and logical arrangement of testing machines. Designed and built under FritzÃ­s personal supervision, the laboratory was of modern steel-framed construction. The laboratory was well suited for its intended purpose; it was divided into four work areas which were devoted to structural testing, cement testing, making and storing concrete test specimens, and hydraulic studies. The initial laboratory equipment, personally chosen by Fritz, represented the state of the art in testing technology. There were twelve principal pieces of testing equipment, the most important of which was an 800,000-pound capacity Riehle universal testing machine. When installed, it was the largest vertical screw-driven universal testing machine in the United States. It was capable of testing tension members up to 20 feet and compression members up to 25 feet in length. The total cost of the laboratory exceeded $50,000, to which Fritz subsequently added another $150,000 to serve as an endowment for continuing maintenance of the facility. As a leading center for studies in structural engineering, the Fritz Engineering Laboratory played an important role in the development of Lehigh University, of structural engineering, and of constructed facilities in the United States. In 1955, these capabilities were enhanced by the construction of a modern addition which housed a 5,000,000-pound capacity Baldwin universal testing machine, one of the largest in the world. The new building was attached to the long side of the high bay of the original building, thus eliminating the right-side low bay of the original building shown in as it looked before 1955. A steel cantilever truss with a 300-foot center span and two side spans of 125 ft each, crosses the Delaware River between Easton, Pennsylvania and Phillipsburg, New Jersey. It was built in 1895-6 to the design of James M. Porter, a charter member of the Section. The building contractor was the Union Bridge Company of New York City whose president, Charles Macdonald, served as ASCE president in 1908. The bridge replaced a landmark three-span wooden covered structure erected by Timothy Palmer and opened to the public in 1806. PorterÃ­s bridge has served the traffic between the two states continuously for 100 years except for a two-year period after it was severely damaged by a hurricane-caused flood in August 1955. The first crossing of the Delaware at Easton was a ferry enfranchised to David Martin in 1739-41. After about a half century of use, the ferry began to be a hindrance to commerce. In 1795 the Delaware Bridge Company was formed and the construction of a substructure for a bridge crossing commenced in 1797. 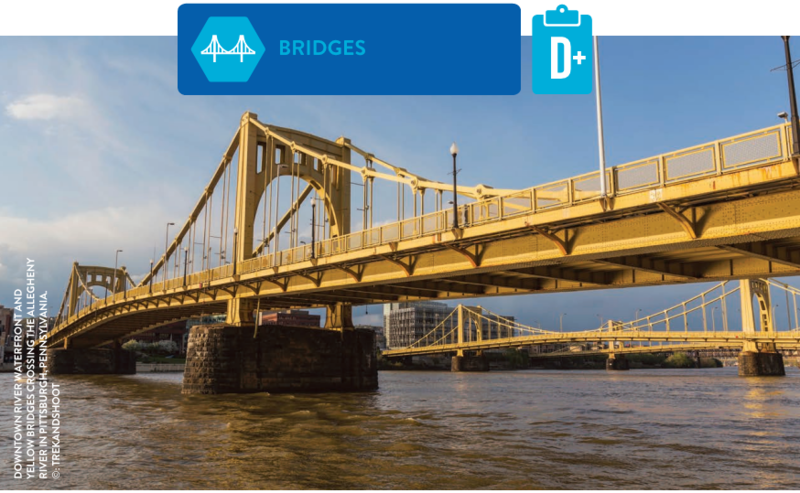 In 1805 the Company engaged the services of the prominent bridge builder Timothy Palmer who designed and erected a covered wooden superstructure of three truss spans 177, 199 and 171 feet long and continuous over two stone piers. The piers were supported on stone-filled timber crib foundations. PalmerÃ­s bridge endured many floods and storms while other bridges fell. However, by the late nineteenth century, when horse-drawn street cars were replaced by trolley cars, the old timber superstructure could no longer handle the demands of traffic. In the 1880s the Delaware Bridge Company decided to build a new bridge of steel. 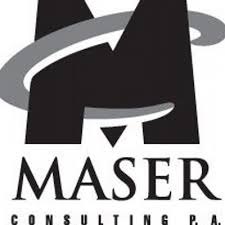 The plans were prepared by James Madison Porter III, who graduated from Lafayette College with the degree of civil engineer and later became professor of civil engineering at the same school. 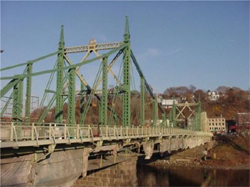 The contract for demolition of the old timber bridge and piers, and for the construction of the new Northampton Street Bridge was awarded to the Union Bridge Company. The Easton Daily Express of October 3, 1894 described the proposed bridge: Ã¬The Cantilever pattern has been adopted, which will give the structure the appearance of a suspension bridge.Ã® PorterÃ­s choice of cantilevered trusses proportioned to resemble the lines of a suspension bridge provided an economical as well as aesthetically pleasing solution. Construction started in April 1895 and was completed in 1896 even though the new bridge was probably opened to traffic in December 1895. In 1921, the Delaware Bridge Company sold the bridge to the Delaware River Joint Toll Bridge Commission. The new owners freed the bridge of tolls. In August 1955, hurricane Diane ravaged and flooded the eastern seaboard, and the Delaware River overflowed its banks. The floodwaters, 44 feet above normal water level at their peak, topped the roadway of the Northampton Street Bridge. Debris carried downstream by the raging floodwaters accumulated against the bridge and caused a break of about 100 feet in the center span. Immediately after the hurricane, two Bailey bridges were erected some 250 feet north of the damaged structure. These temporaries served for two years while work was in progress to repair the damage. The contract for the repairs was awarded to Bethlehem Steel Company in November 1956 and the bridge was reopened to traffic on October 23, 1957. During the summer of 1990, the bridge underwent structural rehabilitation. The project involved replacement of the old concrete decks and installation of new guardrail to protect the steel trusses against vehicle impact. A steel beam bridge deck system was installed for the roadway, and timber flooring was placed on the sidewalks. In 1995, following the dedication ceremony as a National Historic Civil Engineering Landmark, three-dimensional replicas of the coats of arms of Pennsylvania and New Jersey were restored to the bridge. They were part of the ornamentation placed on the bridge when built but were removed in 1971. The first known pumping system providing drinking and wash water in the North American colonies. When the Moravian missionaries from Germany first arrived at the confluence of Monocacy Creek and the Lehigh River in March 1741, they found an abundant spring at the foot of a steep slope that connected the creekÃ­s floodplain with the surrounding country. They built their first house on the upper land directly above the spring and named their future town Bethlehem. For a few years, they obtained their water by assigning to appointed carriers the job of bringing the water uphill. In September 1751 a millwright named Hans Christopher Christiansen arrived in Bethlehem from Holstein, which was then under Danish rule. He devised a method for replacing the water carriers with mechanical pumps and commenced the erection of the first waterworks early in 1754. The water was led from the spring by a conduit to a cistern over which a frame building was erected to houseâ€ five inch diameter pumps made of lignum vitae. The water was forced through wooden pipes 70 feet up the hill into a distribution tank located in a square in the space now occupied by Central Moravian Church. Seven years later, Christiansen started the construction of more powerful permanent machinery. 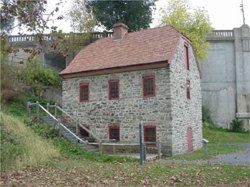 A two-story stone building 22 feet by 30 feet in plan was erected to house three single-acting iron pumps cast at the nearby Durham Furnace. The pumps, of 4-inch caliber and 18-inch stroke, worked by means of a triple crank geared to the shaft of an undershot waterwheel18 feet in diameter. The rising mains, made of gum wood, led the water to a distribution reservoir located on a wooden tower in the square mentioned earlier. From this point the water was distributed into cisterns or tanks built in the vicinity of principal dwellings. The reconstructed works became operational on July 6, 1762. The output of the spring and the water works was 800 gallons per minute. The spring continued to supply Bethlehem until 1912 when it was discovered that the water was contaminated. The spring was then sealed and replaced with wells at other locations in the city. The two-story building is architecturally distinctive. It is made of hand hewn limestone, has Moravian brick arched windows and doors, and is covered with a red tile sloped roof. After several decades of other use, restoration of the stone building was completed in 1973 and of the machinery in 1976. An archeological investigation was carried out under the auspices of the University of Pennsylvania prior to the restoration.